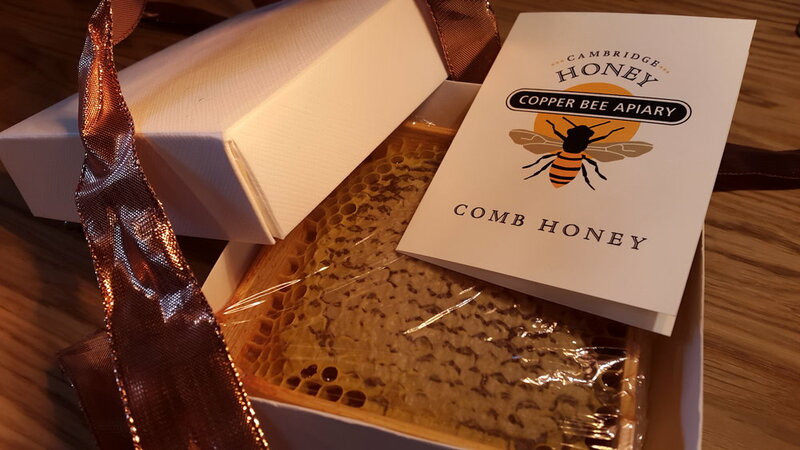 This past summer, the bees in the Copper Hive worked on a new project: sections of comb honey. Guess what people have got for Christmas! I put the section rack on the hive in June. It has an array of individual boxes for the bees to build honeycomb in. Take off a full section rack and voilà, a set of neatly packaged comb honey sections, each in its own wooden box. 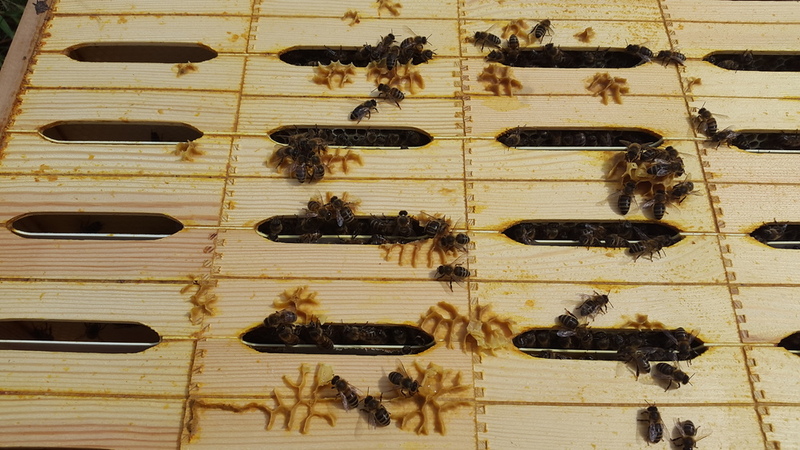 Although you can just cut up ordinary frames of honeycomb, or indeed press out squares of it using a bespoke device, I rather like the neatness and simplicity of having the bees build the comb directly in the individual wooden boxes. The outsides of the boxes get marked with beeswax and propolis, but that is the fate of all objects placed into beehives, reflecting the fact that honeycomb is made in the natural world not a sterile factory. Also, wooden sections require precious little handling, so producing comb honey this way is neater and cleaner than manually slicing up the comb into blocks to fit in little plastic trays. Are you supposed to eat the wax or spit it out? Do you swallow it? I assume if it is all mixed in with corn meal mush or oat meal, then you’re not going to be bothering much with separating the wax from the food in your mouth. But I don’t presume to know that, either. I just filtered all the wax out of my comb honey and rendered it because it seemed like the “thing to do.” Next time, I’ll set at least a little aside for “eating” or whatever you are supposed to do with it in your mouth. The person to whom this endearing question was asked is American Master Beekeeper, Rusty Burlew, who wrote about comb honey and how to eat it. Her recommendations in brief: spread it on hot, lightly buttered toast, chew it and swallow it. The wax will soften and blend deliciously with the honey and toast. 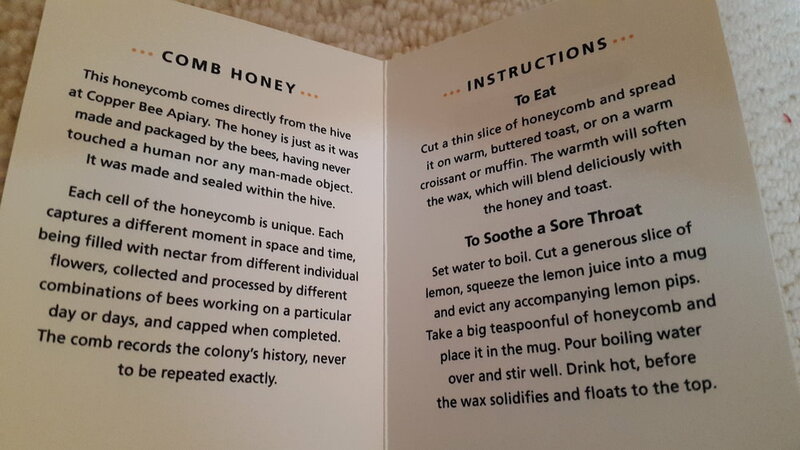 Don't just eat the honeycomb directly because you'll end up with a lump of wax like chewing gum in your mouth. You can read Rusty's reminiscences and advice yourself on her website Honey Bee Suite. I've included her serving suggestion in the information leaflet that I include with each gift comb. I hope you enjoy your honeycomb however you eat (or drink) it!